No one like the smell of baby’s poop. No one likes the sight of soiled diapers either, which is why we have diaper pails. As you celebrate the joys of motherhood, take a moment and think about the hygiene of your nursery. With your new bundle of joy will come diapers, which you will need to dispose of appropriately. You could choose to treat the used diapers as part of the household trash and risk the smell, or you could get a stylish diaper pail that locks in the smell. Diaper pails have come of age. Gone are the days when they just presented in the form of a glorified container. With the odor-eliminating technology and bright colors, your diaper pail will not only have your nursery smelling clean, but it will also look good while at it. Why Should you Buy a Baby Diaper Pail? It is a convenient way of disposing of diapers. You would have all the babies things in the nursery, so it is an easy way of getting the soiled diaper out of your way while retaining the cleanliness if your space. In addition, it would be quite inconveniencing to get out of the house in the middle of the night to dispose of soiled diapers. The modern pails locks in odor-We all know that baby poop smells funky. If you put soiled diapers in the trash to be taken out in a few days, everyone would be walking with a wrinkle on their noses. Diaper pails are easy to empty and clean. They are also compact in size, hence taking less space than most ample trash cans that have a significant footprint. The current crop of diaper pails is not only easy to use, but it is also aesthetically appealing. If you are going to have some sort of disposal system for your soiled diapers, it may as well add color to your baby’s nursery. This diaper pail measures 15 x 10.8 x 22.5 inches and weighs 7 pounds. The body is made of steel, unlike most diaper pails that are made of plastic. Plastic pails absorb the smell, which becomes very difficult to get rid of no matter how hard you try. 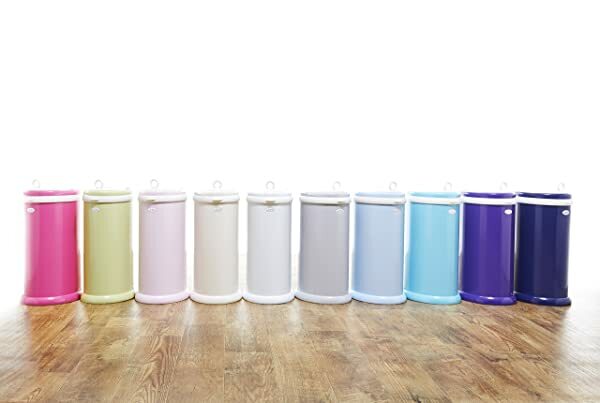 Ubbi Steel Diaper Pail comes in more colors than one. They have the standard white and an assortment of other colors including a bright pink. Why It is a Good Buy? It has a sliding opening to prevent the smell from leaking when open. It has a large capacity to hold up to 50 diapers. The steel prevents the smell from soaking into the body of the pail. Easy to install a new bag. It could let out some smells when you slide the lid open. This diaper pail is sleek and lean. It does not call attention to what it really holds inside and it adds some style to your nursery. It has a foot pedal, which we find quite impressive. It the tip of the lid, inside the Munchkin Step Diaper Pail is a lavender-scented baking powder dispenser that can contain the smells inside. The baking powder not only absorbs the stink, but it also dispenses lavender goodness so that the aroma hits you each time you open the pail. The second lid when you open the diaper pail can seal the disposal liner. It opens it long enough for you to let in the soiled diaper them seals it so that the smells stay in the diaper pail. We would advise that you close the lid as soon as you are done dumping the diaper in to prevent the sneaky smell from escaping through the tiny opening. Munchkin Diaper Pailworks well with both refill rings and Snap, Seal, and Toss refill bags. The seal does a good job holding it together but you can snap it too. It has a child proof lock that keeps your baby away. They can fiddle with the diaper pail, heck, the can even topple it if 12 pounds is not too much for them. What they cannot do, (to their chagrin) is gain access to the contents of this little monster. The lock keeps you from wandering what they are up to. What Makes This Diaper Pail Worth It? The price is quite steep, but if you factor in the sturdy material is built for longevity, you will see sense. It does not absorb smells within it, as the lavender baking powder keeps it fresh. The foot pedal is a winner. The lavender baking powder locks in the smell. Very easy to clean the rim. Out-of-reach button keeps curious babies from opening up the diaper pail. You have to manually close the lid, which is weird. This diaper pail measures 21.5 x 12.5 x 9 inches and weighs 6.7 pounds, which is not too much space in your nursery. It is made of ABS plastic, which is sturdy enough to withstand constant knockdowns and still last long to get your baby out of the diaper stage. It comes in white, gray, and sage for diversity. The sleek exterior gives your nursery a beautiful look as much as it makes your work easier. It conveniently holds up to 45 newborn size diapers. This diaper pail is 100 percent hands-free. It has a sturdy foot pedal that opens the lid to allow you to drop the soiled diaper. The weight of the diaper enables it to slide into the pail without your hands having to intervene. When it comes to contain the inevitable smell, the trap door locks as soon as you remove your foot on the pedal. The secondary lead on the pail also keeps the smell from leaking when the trap door opens. Dekor refills are powdered with an aromatic powder that absorbs the bad smell and fills the air with the new scent. Is This Pail A Good Investment? It is small and well designed, and so it occupies less space. Keeps in the smell very well. The refill bags are totally impractical and difficult to use and refill. This pail has features similar to the classic from Dekor, only that it is slightly larger. It can hold up to 60 newborn-size diapers, and you can squeeze in some more if you are not able to empty it immediately. The opening is large enough to let in well-folded cloth diapers. Dekor Plus Diaper Pail measures 24 x 15 x 11 inches and weighs 9 pounds. While your baby will eventually be tall enough to reach the top, they will not gain access to the contents to the pail because the child lock in it is solid. The opening that allows you to throw in the soiled diaper is lockable in a way that your toddler cannot open. The pail is made of ABS plastic, which has a long life. It is fade and dent free so that you can have it for a while, and it will still look new. There have been reviews by customers who say they have had them for 2+ years and that they look the same way they did when they bought them. What you will fund fascinating as we did was the refill where you will kit have to worry about wasting a whole paper when you empty your pail after three days. You simply cut the refill from a cuter in the lid and tie a knot at the bottom of the remaining bag. Is This Pail Worth The Cost? Bigger design compared to the Classic, so it can contain more diapers. Work great for cloth and disposable diapers. 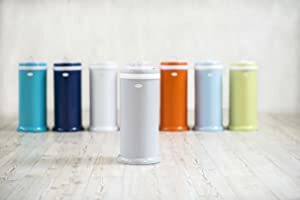 This diaper pail is simpler than almost all the pails we have encountered (and we have seen many of them as we were putting together this review). It is made of plastic, and it could pass for a simple trashcan. It has a wide opening that will make disposal quite easy. You do not need to have an insane aim. The pail lacks a foot pedal, so it is fully hands-on. At the top lid, it contains a small section that holds a deodorized disc, which locks smell. You can add some baking soda to fight the smell more efficiently. The pail does not require refills. You can use regular plastic bags to line the pail and dispose them when you need to. It can handle up to 20 newborn diapers before it requires emptying. Most importantly, the removal process, which you only need to open the entire lid and fetch your bag of soiled diapers, makes it a perfect option. You do not have to worry about your curious toddler digging out their soiled diapers (as they are wont to) because the trap door has a safety lock. You can lock the trap door with a button at the top of the pail to keep them from opening it. The cheapest model among these diaper pails. You do not have to spend money on expensive refills. The trap door is large enough for easy disposal. It does NOT contain the smell well like other diaper pails. Changing diapers is perhaps the most troublesome and smelliest part of raising a toddler. Bearing the smell is not an easy task, and the question as to how to dispose of the diaper is one that tends to trouble quite a few parents out there. Once the baby is started off on solid foods, the stink of diapers tends to increase by many folds. Therefore, parents want to make use of some ways via which they could prevent this bad odor from spreading. No one would like the bad stink taking over the garbage can and neither does everyone have the patience to take out the diaper to the garbage area multiple times a day, considering that babies need to be changed countless times throughout the day. In such a situation, it is a diaper pail that comes to the rescue. Some parents do take dirty diapers out to the trash can all the time. However, this is not a convenient option. Making use of a diaper pail can provide you with a lot of ease and feasibility. Using a diaper pail has a lot of benefits. It saves you from countless trips for disposal of the diapers. If you are wondering why a diaper pail is a requirement, it is because using a regular trash can would end up stinking the whole place and you would need to do something about it soon enough. A diaper pail is an odor containment that is designed to ensure that the odor of the diaper remains sealed in it and does not make its way out. Attention is paid to ensure that the smell does not spread every time you use it and you can change the bag without having to worry about the release of the odor. Diaper pails do come in handy if you have a toddler. However, most parents tend to think that just any diaper pail would do and end up opting for cheap diaper pails without paying heed to other factors or making an attempt to find out more about them. The thing that most people fail to realize is that there are options when it comes to diaper pails. Two main types of the product are available on the market. Each type has its pros and cons, and one needs to consider what each type has to offer so that he finds something that would suit his requirement. Therefore, when you head out to purchase the product, you need to ensure that you know more about diaper pails no odor. Let us now shed some light on the two types present that are the dry and wet diaper pails. This diaper pail bears quite a bit of similarity to a trash can. A liner is used with this type of diaper pail, and it does not contain any standing water. It can be used for both cloth and disposable diapers with ease. You should shake the cloth diapers before dropping them in the pail. Some people tend to soak the cloth diapers before placing it in a dry diaper pail, thereby ensuring that it remains wet inside it and staining is minimized. A dry diaper pail has quite a few advantages to offer. The fact that it is usable for both cloth and disposal diapers is quite a huge benefit since this ensures you do not need to think of ways to dispose of one type of diaper while you use the diaper pail for the other. It is quite light in weight, so you would not have to face any difficulty in moving it around or lifting it. Using it is quite easy and convenient. It is found to be a relatively safer option as compared to the wet diaper pail, more of which we will discuss shortly. Without a doubt, there are some drawbacks. You might have to face the problem of staining of the cloth diapers since they do not contain any water. An additional liner is also required. You might have to deodorize the pail regularly, which is not an easy thing to do if you find it hard to deal with the smell. This is another type of diaper pail you will find on the market. It is designed especially for cloth diapers since the disposal diapers do not need to be washed. In the case of a wet diaper pail, the container is filled with water in which cloth diapers are soaked to the point that they are washed off in the washing machine. Some parents also like to add things like baking soda to the water to eradicate the smell completely or to prevent staining. It needs to be kept in mind that bleach is not something that can be added to a wet diaper pail. Bleach carries a risk of destroying your cloth diapers. This type of diaper pail also has various benefits to offer. It proves to be a better option to deal with cloth diapers since it prevents stains and provides them with a pre-wash soak. If you know how to use this diaper pail properly, there is less odor that you would have to deal with. This diaper pail carries some disadvantages as well. For starters, it is provided with a heavy design, so lifting it is not easy for some. Furthermore, since it also contains water, the weight increases further, thereby making it difficult for you to move or transport it. You also cannot leave the water as it is and would need to change or treat it from time to time. This type of water pail carries a risk of creating a mess since the water might spill. Both types are designed to provide you with convenience and have different things to offer. It all comes down to what you are looking for. While purchasing a diaper pail, various factors need to be paid heed to. Let us take a look at some of these. The major reason for using a diaper pail is to ensure that the bad odor does not spread. Hence, this is the first factor that you should focus on while purchasing a diaper pail. You need to determine whether the diaper pail is capable of providing you with effective odor control or not. Two important components of the product influence the odor control that it has to offer: how much it is able to hold in the odor when not in use and how much odor escapes it when you use it. These are two integral questions that you should focus on. Endeavor to find a diaper pail that is able to control the odor in all situations. You should opt for a diaper pail that has a lot of ease to offer you. Do not purchase something that is too complicated and difficult to use. Most of the diaper pails can be used with a single hand in the beginning. However, as the bag gets filled, this becomes difficult. You need to ensure that the diaper pail you purchase is easy to use at all times. The lid should be easy to close, and it should offer you with a single-hand mode of operation to make things easier for you. At the same time, the diaper pail should be such that it has a safety lock so that a child cannot open it while playing, which could be dangerous for him. Some diaper pails end up complicating this quite a bit and as a result, problems arise. You should focus on finding something which would offer you ease in this task. Installation of a new bag should be easy, and you should not have to deal with a lot of smell as you remove the old one. The design of the pail would influence this. Furthermore, you should endeavor to ensure that you do not opt for something that would get filled within a short span. Purchase a diaper pail that has sufficient capacity. It is not just about how much a diaper pail costs. You should also keep in mind that some additional costs are also involved. You need to think about the capacity of the bag and the number of times that it would have to be changed. You should also endeavor to find something that is profound in quality yet does not end up overburdening you with its cost. Looking for the right diaper pail might not be an easy task. Once you manage to find the right option, you can put all your worries to rest, so this is something that you should give adequate attention. Most people tend to have the misconception that all diaper pails are the same. This is far from reality, and if you fail to be careful with your purchase, you might end up missing out on the benefits that they have to offer. Using a diaper pail makes things easier for you in more ways than one. Let us take a look at some of the benefits that it has to offer due to which you should contemplate making use of the product. Having to head out to dispose of a dirty diaper can be quite frustrating. You can also not leave the stinky thing inside your house as the smell would eventually become unbearable. With a diaper pail, this is not something that you would have to worry about. You can ensure that you get rid of the dirty and smelly diaper without having to head out for it. A diaper pail can be used while you have a baby in your hand since most of the options available on the market can be operated by a single hand. This ensures that you do not have to worry about having someone look after the baby as you focus on getting rid of the diaper. You will come across some houses which get engulfed with the smell of a baby. This tends to get rather troublesome at times. Using a diaper pail ensures that your house does not become a hub of stinky odor where it would become difficult to breathe. You would not have to be apprehensive of guests coming to your place owing to the smell and can ensure that your house is welcoming to all. When it comes to kids, you have to be rather careful with how you dispose of stuff since there is always a chance that they would get access to it, which can be dangerous for them. This is something that can be evaded with the usage of a diaper pail. Most of the diaper pails contain a safety lock which prevents kids from gaining access to the inside contents of the pail, thereby ensuring that their safety is not compromised. You will not have to keep an eye on your kid to ensure that he does not end up gaining access to dirty diapers since they are locked away safely. Storage of all the dirty diapers in a single place also ensures that hygiene is not compromised and all the dirty contents remain stored at a single place. Cloth diapers also get cleaned in a better way thanks to the usage of a diaper pail. With this product, you can ensure that the germs and b﻿﻿﻿﻿acteria associated with the dirty diapers do not get spread and they do not serve as an attraction for other microorganisms. With diaper pails, you do not have to worry about dirty diapers for a long time. They can be disposed of with ease, and you do not need to think about getting rid of them every time your kid poops. Parents have to pay attention to a lot of things while raising a baby. There is so much to pay attention to. At such times, they do not need the added worry of dealing with stinky and dirty diapers. Hence, if you make use of a diaper pail, that is one worry which is off your shoulders, giving you more time to focus on the other important matters. This also works in favor of the kids. You would not need to have someone else over to supervise your kids while you head out to dispose of the smell. There is a negligible chance of the baby acquiring access to the dirty diaper, ensuring that his safety is not something that needs to be thought about. Therefore, a diaper pail is an appealing option since it makes things easier and convenient for all concerned parties. After hours of research, we highly recommend the Ubbi Steel Diaper Pail. It provides you with optimal convenience. It is light in weight and can be carried around with ease. Furthermore, installation is not something that you would have to be worried about and the capacity of the bag is impressive. It is also quite reasonable in terms of price.